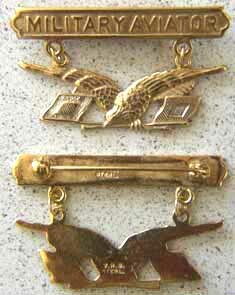 In 1913 the Military Aviator Badge was authorized by Congress and was awarded to 27 or 28 Signal Corp.. Pilots. This first group of these were made by the US Government in 1913 and only 27 or 28 pilots received the badge. Well additional Pilots came along so the government entered into a contract with Blackinton to make this badge. The Blackinton differs form the original in that that the Eagle was die struck and on the original is was cast. Also the badge is slightly larger. This is a museum quality reproduction of the Blackinton version of the First Military Aviator Badge in sterling silver with a 24-karat gold plate. Note the silver is shown in the signal corp.. flags as it was done in the original. A very rare badge not found in many collections. Here is a chance to own one until an original comes along.